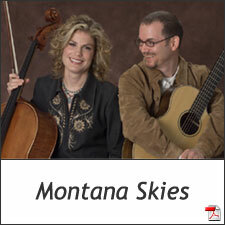 Cellist Jennifer Adams and fingerstyle guitarist Jonathon Adams have crated a unique new sound with this unusual pairing of instruments and an eclectic mix of classical and modern music. The warm, soothing sounds of the cello blend smoothly with the fast, yet clear, playing of the guitar. Sheet music for Jonathon’s guitar compositions are published by Mel Bay Publications, and his music was included in the collector’s edition of the “World’s Finest Fingerstyle Guitarists.” In addition to classical cello, Jennifer also loves playing many other styles, including folk, celtic and jazz. She will also perform with her custom six-string electric cello.